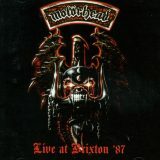 Motorhead Live At Brixton ’87 was originally released by Roadrunner Records back in 1994. Bootleg tapes/copies of this show that were available before that were considered rare collector's items. These live recordings were originally supposed to be used as the band's second live album, No Sleep At All; a follow-up to the highly acclaimed first live album No Sleep Till Hammersmith. Somewhere along the way, the tapes were misplaced and another show on the tour was eventually used for the album. This particular show was a special one as it marked the last show of the band's 1987 world tour for their Rock 'N Roll album, it was just a couple of days before Christmas and the boys were back in Londontown!! The Rock 'N Roll album also marked the return of original drummer Phil "Philthy Animal" Taylor who had been away from the band for over three years. The line-up also included current guitarist Phil Campbell and second guitarist Wurzel. The twin guitar line-up lasted for quite a few years before Wurzel left leaving Motorhead to continue as it originally started out to be, a three piece band. There's a healthy dose of the Rock 'N Roll album on this releases as well as other fan favs such as Ace Of Spades and Eat The Rich, all which are performed with the type of reckless abandon that we all know is a staple of any Motorhead show. They rip into the next track barely letting the feedback subside from the ending of the previous song and Lemmy barks and scowls out the vocals in usual form. There's very little in the way of surprises here but the inclusion of the Rock 'N Roll track Just 'Cos You Got The Power gets special attention and this over 8 minute version sees a different side of Motorhead; one that is much more groove oriented and minus the wall of sound. This release is allegedly remastered and if that's the case, I wonder what the difference is between this and the original. The production qualities of this live release are barely above bootleg quality with it sounding like someone hung mikes out in the crowd and that's it. You can hear Lemmy but it's hard to make out the lyrics and there's very little bottom end as far as Lemmy's bass and Philthy's kick drum. The guitars are way up in the mix and hints of feedback squeals and howls are present almost all through the album. The full version of the show which is available in Japan and some other areas has five extra tracks including No Class, Orgasmatron, Motorhead, Killed By Death and Overkill. I fail to see the reason why we don't get the full show with this release here. I love Motorhead and have ever since hearing the Ace Of Spades album in 1979. I'm not as much of a fan of their live shows. I've seen them twice and both times the deafening volume and feedback was just too much. It's difficult to really tell what they're playing until they play a familiar hook or chorus line. For me, Motorhead is much more enjoyable for their albums. Live At Brixton '87 is just for the serious fans only and those who own, collect and enjoy bootleg quality live recordings. A legendary show is now widely available for the first time but approach with caution!! !